Use an available expansion card slot to install a hot swappable 2.5in hard drive. The S25SLOTR Trayless Hard Drive Rack can be installed into an available (full profile) PCI expansion card slot, providing easy access to a bare 2.5" SATA hard drive or solid state drive (SSD) from the rear panel of a computer case. Unlike conventional hard drive enclosures, the S25SLOTR hard drive rack doesn't require that a drive be installed in a drive tray, saving the time and hassle involved in having to mount or install the hard drive for access to drive contents. Once installed in a PCI slot (and accompanying rear panel bracket), installing a 2.5" SATA HDD is as simple as inserting it into the trayless rack. To remove the hard drive, simply hit the eject button to unlock the access door, allowing the drive to be pulled out of the computer without having to dismount the drive. 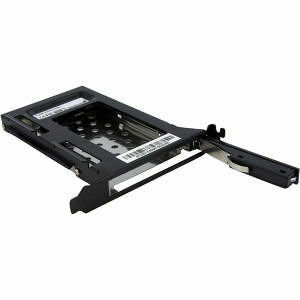 This unique design of the mobile rack enables you to use any available full profile expansion slot to mount a removable 2.5in SATA hard drive.